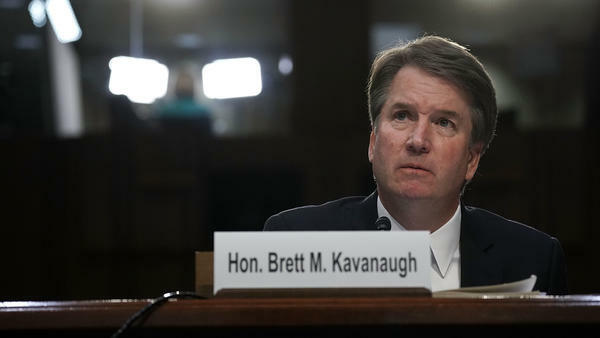 Supreme Court nominee Judge Brett Kavanaugh testifies before the Senate Judiciary Committee during his confirmation hearing Sept. 6. The decision follows the release of a letter sent to Senate Judiciary Commitee Chairman Chuck Grassley from attorneys representing Christine Blasey Ford, the woman who accused Kavanaugh of sexually assaulting her more than three decades ago when they were teenagers. In the letter, Ford's attorneys said an FBI investigation should be "the first step in addressing her allegations." Ford's attorneys argue that an investigation is necessary so that "the Committee is fully informed before conducting any hearing or making any decisions." Ford's attorneys also say that since she went public with her allegations "she has been the target of vicious harassment and even death threats." They also complained that the committee scheduled Ford to "testify at the same table as Judge Kavanaugh in front of two dozen U.S. Senators on national television to relive this traumatic and harrowing incident." Grassley's decision echoed the sentiment of Sen. Orrin Hatch, R-Utah, a former chairman of the Senate Judiciary Committee. "The FBI does not do investigations like this. The responsibility falls to us," Hatch tweeted, adding "We should proceed as planned." Ford's attorneys stopped short of saying Ford will refuse to appear before the committee while objecting to the rushed timeline and comments from Republican senators who seemed to question her accusations. "We should honor Dr. Blasey Ford's wishes and delay this hearing," Feinstein said in a statment. "A proper investigation must be completed, witnesses interviewed, evidence reviewed and all sides spoken to. Only then should the chairman set a hearing date." Murray and other Democrats are drawing a direct parallel between the claims against Kavanaugh and those raised in 1991 when Anita Hill accused Clarence Thomas of sexual harassment during his confirmation hearings for the Supreme Court. At the time an all-male Senate Judiciary Committee aggressively questioned Hill in televised hearings, cast doubt on her accusations and ultimately voted to move Thomas' nomination to the full Senate which confirmed him to the court. That incident inspired a record number of women to run for federal office that cycle, including Murray, who was elected the following year. Murray told reporters America — and women in particular — will be closely watching how Ford's case is handled. Come Monday, both Supreme Court nominee Brett Kavanaugh and university professor Christine Blasey Ford may appear before the Senate Judiciary Committee. Senate Republicans say Ford has yet to accept the invitation, although just yesterday her lawyer told NPR she'd be willing to testify. Ford has accused Kavanaugh of sexually assaulting her when they were teenagers decades ago. Her allegations have put his nomination in question. And to tell us where things stand now, we're joined by NPR congressional reporter Kelsey Snell. And, Kelsey, give us what you've learned so far. Where do things stand now with this nomination that was once on a fast track? KELSEY SNELL, BYLINE: Yeah, Republicans canceled a hearing that they had planned for this Thursday to vote on his nomination. And instead they've announced plans for a hearing on Monday. And they invited Kavanaugh and Ford to appear so that they can both explain their side of the story. Now, Kavanaugh has repeatedly said he didn't do anything like what he's been accused of. But Judiciary Committee Chairman Chuck Grassley says they've had zero response from Ford about coming to this hearing and that they haven't heard back from her attorney either. And I should be clear. NPR has also made several attempts to reach Ford and her attorney without any response. Now, some senators are raising questions about why they would bother having a hearing if she doesn't participate. But Republican leaders say they've offered to allow her to testify behind closed doors or in an open hearing, which leaves open the possibility that the public will not actually ever hear this testimony despite Republicans saying the whole point of the hearing is to get her side out in public. CORNISH: And Democrats - are they OK with that plan? SNELL: No, they're really not. They say they need more time, and they want to call more witnesses. Patty Murray, who's the No. 3 Democrat in the Senate, was pretty forceful about it today. PATTY MURRAY: Scheduling a hearing for Monday, a week from when Dr. Ford made her accusations public, is a shameful attempt to jam this through without giving anyone the time they need to investigate and put together the questions that need to be asked. SNELL: So that's basically their whole argument here - is that they need more time, that this accusation is very serious and that there needs to be research. And Republicans said just a bit ago that they reached out to Mark Judge, who was a witness that Ford alleges was present at the party where she says she was assaulted by Kavanaugh. And Judge responded in a letter saying that he has no memory of the incident and declined to appear. So it's still kind of evolving. CORNISH: There's also been some controversy about the FBI's involvement in all of this. CORNISH: Now, given that the alleged assault happened more than 30 years ago, what is the FBI's role here? SNELL: Well, that's up for some debate. Democrats say the judiciary committee and their members just really aren't equipped to be handling an investigation into an accusation of sexual assault. They say the staff on that committee does background checks and looks into legal matters for nominees. And that's really different, they say, than conducting a sweep of someone's behavior more than 30 years ago when they were in high school. Democrats say they don't want to be putting Ford on trial and that the hearing Republicans are proposing could become a kind of he said, she said. And, you know, that's something that Democrats say they would like to avoid and that the FBI could help make that happen. CORNISH: But does it look like they could even reopen a case between now and Monday? SNELL: Yeah, not at this point. President Trump has said he doesn't think that the FBI should be involved. And Republicans on the Hill say they have no authority to force the FBI to open investigations. So Trump addressed it several times today, including this morning. PRESIDENT DONALD TRUMP: I don't think the FBI really should be involved because they don't want to be involved. If they wanted to be, I would certainly do that. But as you know, they say this is not really their thing. But I think politically speaking, the senators will do a very good job. SNELL: Now, he repeated something really similar this afternoon when he told reporters that the FBI already did six background checks into Kavanaugh and that he said again and again this really isn't the FBI's thing. So it doesn't sound like this is something that the White House is really going to push for. CORNISH: So what is the strategy for Senate Republicans? SNELL: They're going out of their way to be very public about the steps they're taking to interview witnesses and contact Ford. They're sending reporters constant emails with these updates on their efforts, and they're active on social media. They've said over and over that she deserved to be heard. But they're saying Democrats aren't participating in this. So they're not really showing any signs of slowing down. And one thing they want to avoid is any comparisons to 1991 when Anita Hill accused Clarence Thomas of sexual harassment at his confirmation. So they're really trying to keep it out in public. CORNISH: That's NPR's Kelsey Snell at the Senate. Kelsey, thank you.